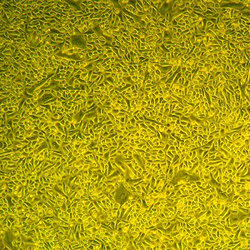 Lifeline® normal Human Mammary (Breast) Epithelial Cells (HMEC) – female, when grown in Lifeline® MammaryLife™ Medium, provide an ideal serum-free culture model for the study of the stages of breast cancer development, three dimensional culture, carcinogen screening, and other areas of breast research. Lifeline® Female Mammary Cells have been isolated, plated, and expanded in culture vessels three times before being harvested for cryopreservation to ensure the highest viability and plating efficiency. Our HMEC are quality tested in MammaryLife™ Medium to ensure optimal morphology and growth over a period of at least 15 population doublings. 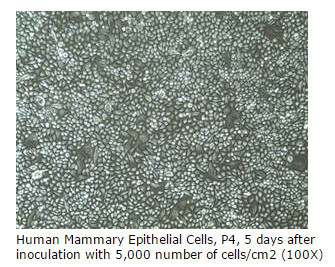 Lifeline® Female Mammary Cells are a mixed culture of epithelial cells bearing positive markers such as Cytokeratin 14 (myoepithelial), Cytokeratin 8/18 (luminal), and Cytokeratin 19 (luminal subpopulation). Lifeline® Cell Technology provides products using the highest quality raw materials and incorporates extensive quality assurance in every production run. Exacting standards and production procedures ensure consistent performance.